Euge! I won a signed copy of The Sewer Demon by Caroline Lawrence in a Twitter competition from the Big Book Babble! This sent me into slightly unreasonable levels of excitement. Partly because I’ve never won anything in a prize draw before, but mainly because The RomanMysteries series has been a favourite of mine for a long time. I was introduced to the Roman Mysteries books by my cousin’s daughter, who a) was in love with the series, and b) was amazed and overjoyed that she had written to the author, Caroline Lawrence, and Caroline had actually written back! Not all authors will do this, mainly because they are so busy, but I remember having a similar experience when I was younger and it really does make such a difference to a child. Anyway, I was studying Classics at university at the time, so “it’s about Romans” was (and still is, if I’m honest) enough on its own to get me excited. 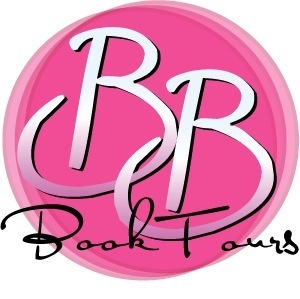 A combination of ‘Romans’ and ‘friendly author’ meant they were a must-read. I borrowed one from the library, reading horribly out of order (The Sirens of Surrentum), and on the strength of that one book alone I bought a set of all the books written to that point, with the beautiful second generation covers. Every single one was good, and I’ve been collecting them ever since. 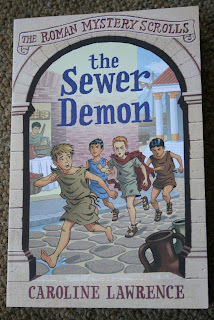 The Sewer Demon is a companion book to The Roman Mysteries series, moving away from the Roman Mystery children to focus on a new main character, a boy called Threptus. Readers of The Roman Mysteries books might remember Threptus, who popped up in The Man from Pomegranate Street, and in ‘Threptus and the Sacred Chickens’ in The Legionary from Londinium and other Mini Mysteries. Threptus is an eight year old boy living in Ostia, once a beggar, but now working for Floridius, who is a prophet, soothsayer, amulet-seller and dealer in sacred chickens! This is the first in a new series called The Roman Mystery Scrolls, which seems to be aimed at slightly younger readers, with shorter books and ruder humour. 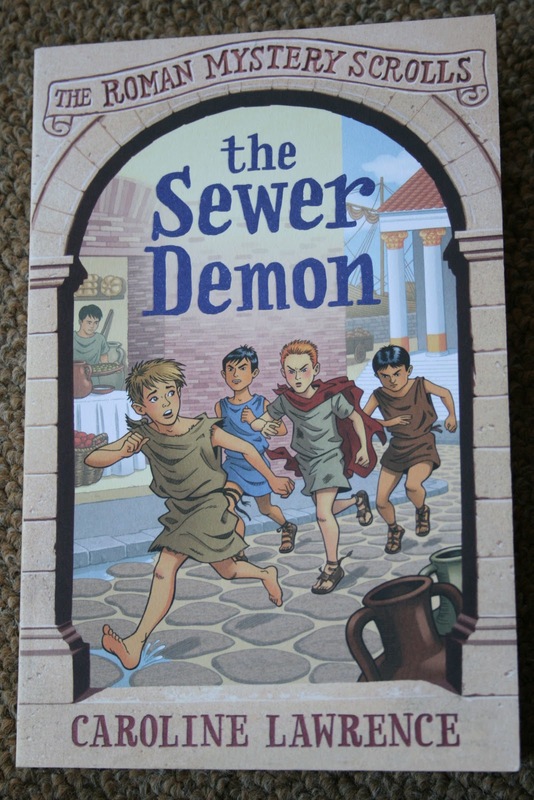 The same easy-going and humorous style of The Roman Mysteries series is found in this book, with plenty of jokes that both young readers and their parents can enjoy. The curses (Pollux!) and exclamations like ‘Great Juno’s Beard’ always make me laugh out loud. Because the story is set in Ostia, familiar faces and places appear. 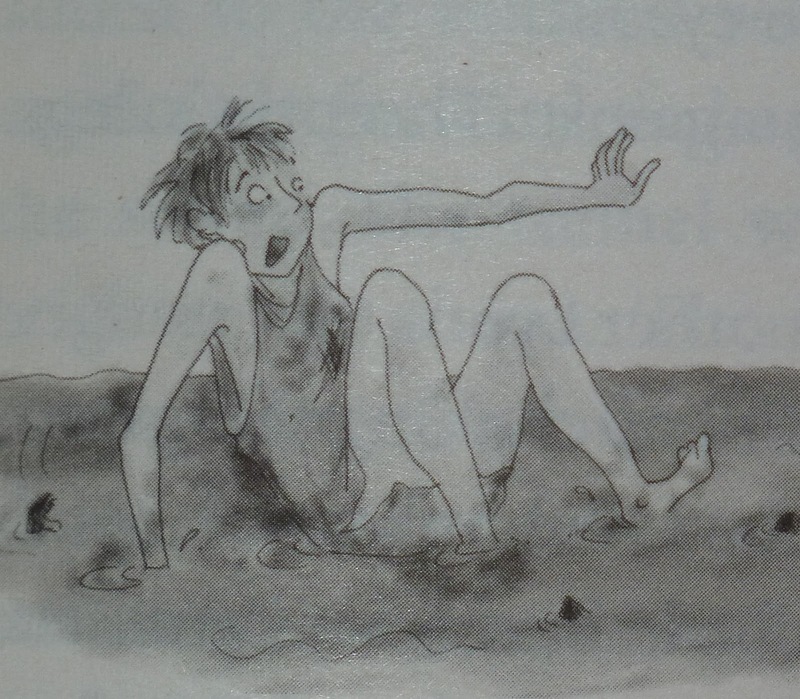 At one point Threptus is forced to crawl through the town’s sewers, and learns why the local magistrate Bato should never eat cumin-dusted eggs. The mystery is intriguing and solving it is fun, with the usual variety of fascinating Roman facts and titbits incorporated into the story. I’ve never noticed anything un-historically accurate in a Roman Mysteries book, and the same goes here (makes sense – the author really knows the Ancient World). Caroline Lawrence has a wonderful ability to conjure up places and people so well in so few words, and her characters are always so alive they jump off the page. (The little illustrations that accompany each chapter pick up on this brilliantly. Here’s my favourite.) 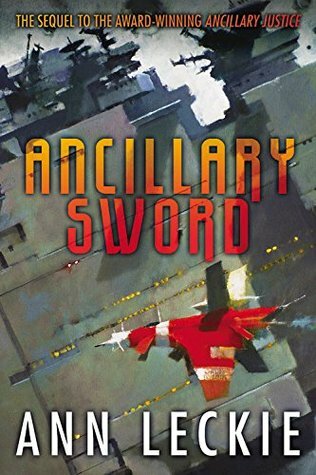 The pacing is spot on, there are no boring bits, and no scene is wasted or ‘filler.’ It’s a very easy read. This would make it a perfect book for younger readers or less confident readers, before diving into the more complex mysteries and plotting of the Roman Mysteries stories. It’s also a great companion book for readers who are already fans of the Roman Mystery world. So, that was my two weeks of free movie rentals. Some good films, some fairly good, some shockers, and a few average ones. Not bad for a bunch of freebies! 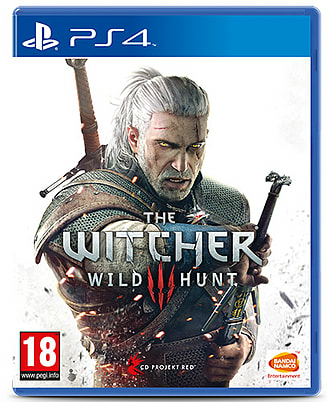 I chose this one hoping for a bit of really stupid fun. 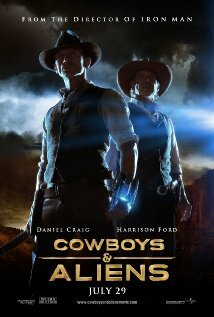 I was hoping, to be honest, for exactly what it said on the box – cowboys, and aliens (translation: lots of cheese). What I got was really stupid, that’s for sure, and admittedly most of the time it was quite fun. Yet, I just didn’t feel that it ever reached the potential that such an epic title suggested. It just wasn’t quite fun enough. It’s a shame the aliens weren’t done so well. In fact, they felt like a bit of an afterthought, which is strange considering they were the other 50% of the concept. Weird, ugly, scrabbly ape like things with big teeth... well, at least it’s nice to see the apetroll from Super 8 getting more work. Their look wasn’t inspiring or frightening, just a bit lazy and boring. They had the technology to zap the entire world into oblivion, but still prefer to run at their attackers, jump on them and claw them to death. This is when they are being attacked with guns, and in fact possess much better guns themselves. And then you have to wonder why they’re mining gold on a scouting mission, and if it is a scouting mission why they aren’t heading straight back to their planet to tell their mates what wusses we all are on Earth, and if it is in fact a mining mission why they haven’t blasted every town for hundreds of miles? Why take prisoners, burn a few houses and leave the rest? Oh right, experiments. Aliens love to experiment for some reason. To find weaknesses, the justification is. You’d think ‘die like insects when shot with giant laser guns’ would be enough of a weakness to make further testing a little redundant. So the aliens, as is often the case, are stooopid. But clever enough to build spaceships that can presumably travel FTL. And have the war skills to destroy the homeworld of another alien being who can shapeshift, travel to Earth, work out how to manipulate an alien gun into a bomb, and blow up the whole alien spaceship with ease. So if they can obliterate such an advanced alien race, why are they having such trouble with the cowboys? And why in the name of all that is holy aren’t they just shooting them with their superior alien laser guns? Yep, this is bang your head against the wall kind of stuff. Add to this some fairly lazy storytelling, the odd plot hole, and a baffling plot twist that needlessly only opened up further plot holes, and you can see why the movie isn’t thought very highly of. However, none of this would have been a problem for me if the film had embraced its silliness a little more and just gone for it with the full-on cheese factor. But it didn’t. The parts that were told with a twinkle in the eye were good, but the bits that were trying to be too serious just failed utterly. And while the concept was a great one, the aliens themselves were just too uninteresting and exasperating to make it work. What a shame! I loved Tintin when I was younger, so I was quite excited about this one. Great characters, so many fantastic stories to choose from, and Spielberg directing. The chances of it being something great were pretty high. Unfortunately, while there were parts of it that I thought were done very well, overall this was slightly disappointing. I found some of the characters spot on. Haddock was brilliant, and Thompson and Thomson were perfect. Villains and side characters had just the right mix of personality and slightly Victorian melodrama. Snowy was snowy. Tintin, however, just... lacked something. And I can’t quite put my finger on what. His animation was good, his look was just right, he had the right sort of ageless feeling about him, Jamie Bell did a truly excellent job with the voice acting... so, what was wrong? There was just something missing, something of the Tintin charm, something that made this Tintin slightly irritate me whereas the real Tintin never would. Something almost sarcastic in his expressions that was perhaps the result of the 3D style animation. Did I simply have impossible expectations? Maybe. But it was slightly off-putting, nevertheless. The humour in the film was generally good, particularly when Haddock was involved (though burping into the plane’s engine was a little much), and at first the atmosphere managed to find the right mix of exciting and intriguing. Escaping from Haddock’s ship was probably the best part of the film. After this, the film perhaps suffered from one chase scene too many. Yes, Tintin is pretty much adventure personified, but that doesn’t mean the film needs to resemble a Prince of Persia video game. After all, he is a reporter, and this is a Tintin movie. Audiences do expect investigation. In the face of what felt like a slightly desperate attempt to keep action up at all costs, I began to lose a sense of where the plot was going, and I lost interest in the mystery. It even became a bit boring at points. It’s not a good sign that the Thompson and Thomson wallet-stealing sub-plot was probably more compelling than the actual movie’s storyline. The film really began to get tedious with the introduction of the giant crane fight – unnecessary, over-the-top, and eye-rollingly stupid. Thankfully, it wasn’t far from here to the end. 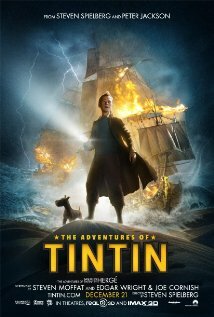 What started as a clever, intriguing and enjoyable film worthy of the great Tintin name quickly lost its umph. The film wasn’t bad, but a film about Tintin should have been so much better. It should have been magical, it should have been charming, it should have winked at and grinned at and amazed the audience the entire way through. I would have liked it to have that same certain something that Indian Jones films possess. I should have emerged in a little bubble of nostalgic joy. I didn’t. I wouldn’t say the film was bad, or that it wasn’t worth seeing. But it was disappointing. 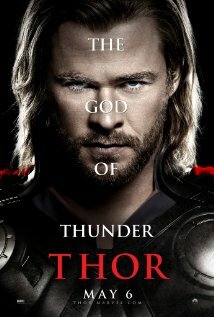 Appropriately enough, considering all the Avengers buzz, my next film is Thor. My response and my husband’s were divided on this one. He really didn’t like it; I thought it was fairly enjoyable, though the way the plot unravelled was a little disappointing. The standard thing to do with superheroes is to start off with their origin story. Makes sense, especially for those with a particularly good origin story, like Spiderman. Unfortunately, the origin story can sometimes turn out to be the most interesting thing about the superhero, so that future outings with him or her fall a bit flat. Like Ironman. Like, well, everyone except the X-Men, really. Some superheroes even have a whole TV series built around their origin (Superman – Smallville, though I’ve actually never watched it). So tackling the origin story of Thor seems like a good move, and in fact, his origin story does happen to be a very good one. However, what we actually got was a bit of a muddle. The first half of the film was Norsey goodness, in Asgard (which looked FANTASTIC by the way), fighting Frost Giants, being blustery and prideful and generally like a good Viking god. Which was apparently bad... BAD Thor for wanting war. The last thing the king of the Viking gods wants is war. What are you thinking Thor? But anyway, this bit of the film was really very good. Then Thor got cast out to Earth, and it sort of went downhill a bit from there. Which is a shame because this has the potential to be a really compelling story. Thor, aware of who he is but unable to do anything about it, powerless as a normal human, has to somehow find a place for himself in the world. Good stuff. Didn’t quite translate. What we actually got was a little too much Natalie Portman, and Thor making amusing mistakes because of not knowing how to interact socially in our world. Then a pointless bit with the hammer that felt like it was just there to shoe-horn SHIELD in. A surprisingly emotional bit where Loki visits and Thor begs to come home almost saved it, but then it meandered into more pointlessness. Thor was basically without powers for about one day (which is all it took to fall in love with Natalie Portman, despite there not being much chemistry there), and then straight back to Asgard again for the final fight. Earth was essentially meaningless except as a minor plot point. Doesn’t this miss the point a bit? It didn’t really feel like a superhero film; it felt like a fantasy/sci-fi focused on Norse-gods-as-aliens. I think I would have liked it better if it had just embraced this completely. Apart from the slightly wonky plotting of the second half, I did enjoy the film. I thought the acting was very good, especially Thor and Loki. Costumes, effects and sets were amazing, and I loved the visualisation of Asgard. This could all have been a bit Flash-Gordon cheesy, but it actually wasn’t. The directing was good, the music was good, everything worked except the plot and the pacing. It did suffer a little, however, from the often inevitable too-much-sympathy-for-the-villain syndrome that these kinds of films produce. I liked Loki better than Thor. Sorry. Couldn’t help rooting for him. I wonder if that will be a problem for me in Avengers? I’ll have to wait and see. So, while I wouldn’t say this was a bad film, I also wouldn’t say it’s one of the best of the superhero bunch. It would really be worth watching for the Asgard scenes alone, but thankfully there are a lot of other things that pull it up too. 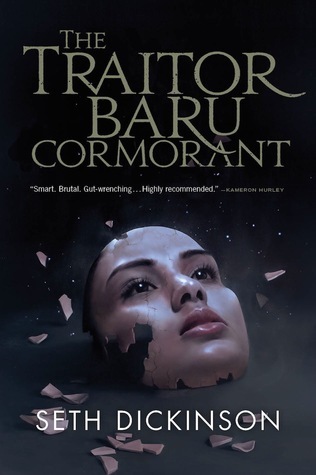 I do feel that it was really only the plot and pacing that let it down, mainly because of the need to cover an origin story in a couple of hours, which was perhaps better suited to serialisation. Thor’s acceptance-redemption-recovery arc needed to be slower and more believable. The director also clearly struggled with the need to include SHIELD to set up Avengers. That part really just shouldn’t have been there. If a second Thor film does get made, I’ll be interested to see what it has to offer now that his origin has been established. With the right story, I have a feeling it could be amazing.